Veerasak Gems is a leader in providing the highest quality rubies direct from the best mining sources in the world, the historic Mogok deposit in Myanmar (Burma) and Montepuez deposit in Mozambique. Expert analysis and quality control are central to Veerasak Gems’ ability to deliver the finest rubies on the market, both natural no heat and traditionally heated stones, of every size from the more common manufacturing products to world heritage rubies found in the company’s extensive inventory. 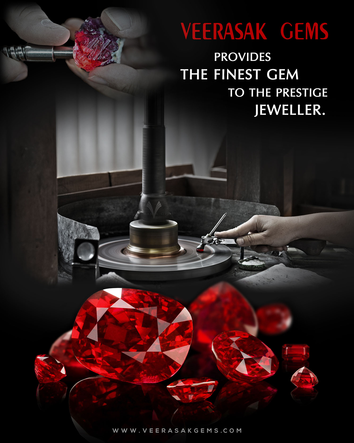 PROVIDES THE FINEST GEMS TO THE PRESTIGE JEWELLERS. With more than 30 years of experience on Burmese Rough, we are producer and wholesaler of all Burmese gemstones (Both heated and unheated) from Mogok and Mong Hsu mines, also trades in a new product line as Mozambique gemstones.